This is also a work in progress - it links to the transcription that can be found here. As far as I am aware this transcription is complete and accurate. There have been developments with this memorial. 3 names are about to be added to one of the bronze plaques that surround the base of the memorial. Much of the information is taken from the Blackpool Evening Gazette (Dec 17th 2012) and some from sources on the internet. Links provided. The other information on Ancestry gives James the middle name Ronald, born in 1915 in Blackpool. He married in 1938 in Blackpool when he was in the Navy. Clearly there has been excellent research by Local Historians here. The second name is Acting Sergeant Barry Jewkes. There is considerable information at this link. It includes correspondence from his commanding officer to to his wife. This is indeed worth following up. The final name is Private Tomas James Dale, a former St Georges pupil. There is a link here. Again searches on the internet will reveal much about Tomas. When the plate is refixed I will photograph it. The Metropole Hotel is on the right of the monument. The monument is set into a depression and it allows a large body to be assembled. I feel that it is quite stern and foreboding. It is located quite close to the tower and in a way echoes its shape. Situated a stones throw from North Pier and the Town Hall it is indeed a stark reminder of the fallen. The newly built choir stall. 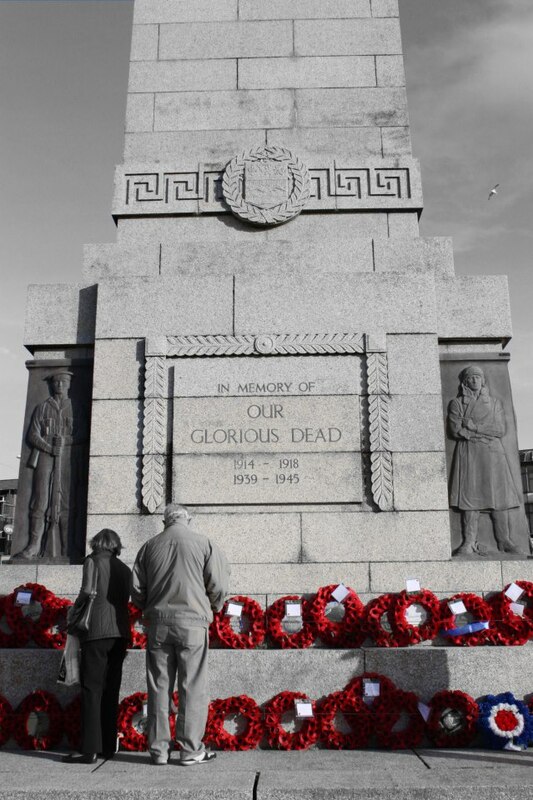 It is at the landward side of the monument facing the tablets of the WW2 fallen. 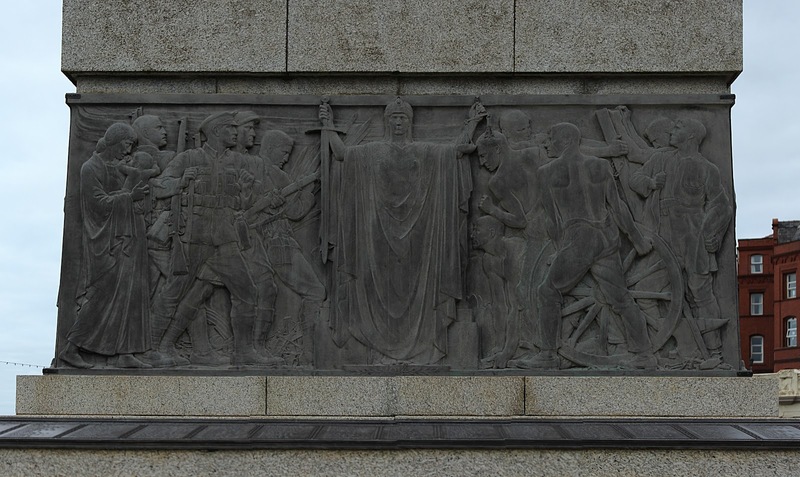 The frieze on the North side of the obelisk. This is a panoramic picture. There are more pictures of details further down. This is labelled 1918 at the bottom. 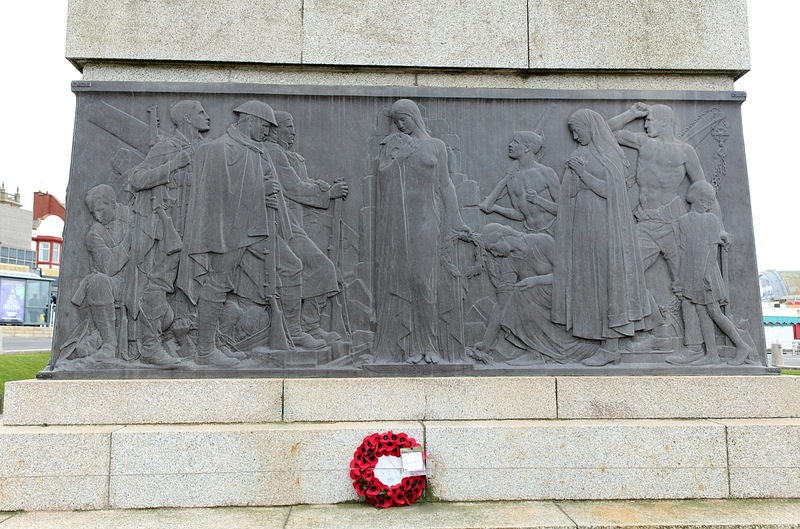 The frieze continues to the right of this soldier. Gilbert Ledward's name is below. Another detail. This is a continuation of the image above. Gilbert Ledward's imagery takes on a timeless wistfulness that does not appear to be of this time. It responds to a time of great hurt. There is little savagery there, a great deal of strength but little anger. But if you look closely at the northern frieze, you will see a trampled German soldier on the left hand side. To the right is the low stone block. The top has the bronze panels with half the names from WW1. Looking to sea. The 2 wreaths are lying against panels of the WW2 fallen. To the right and the left are northern and southern panels of the WW1 fallen. They are raised on coffin shaped stonework. clearly a lion. Seems like a warning of sorts! View to the right of the cenotaph. This is North Pier.